Home » Music » Darling Pet Munkee » Darling Pet Munkee! download is free via bandcamp above! Garage-rock songs based on ads from the back of comic books of yore. So what do you get when you cross Axemunkee with Do Not Forsake Me Oh My Darling? 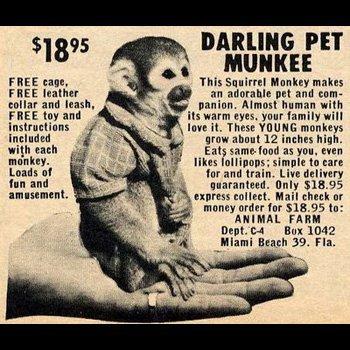 You get Darling Pet Munkee! Brought together on a musical blind date by the beautiful & talented Kelly Davidson (of Etched on Film) on a chilly Friday night in March to write and record a song in an evening as a school project for Greg Morris. After combining our band names, Michael remembered a vintage ad about a mail-order squirrel monkey. We quickly had a trashy garage rock song about ordering and loving this monkey. The whole thing was written and recorded live and tracked directly to 2 tracks all between 7:30 and 9:30PM!!! Next PostSpace Balloons “If You Want A Mustache” music video!